Hello everyone! Here is a simple and easy note card we are making at my Card Club this month featuring the So Hoppy Together Stamp Set and Botanical Butterfly Designer Series Paper in the Sale-A-Bration Brochure. Isn't it so cute? 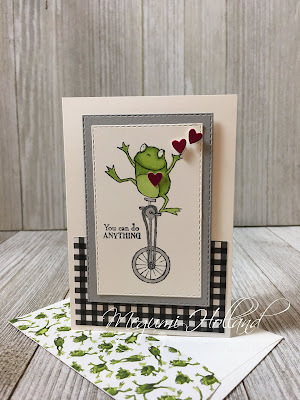 To make this card I simply stamped the image in Memento Black on a stitched rectangle die-cut and colored it with Stampin' Blends (Granny Apple Green and Smoky Slate). This piece is layered with a larger stitched rectangle die-cut. I embellished it with some leftover hearts from another project. Super easy and quick! 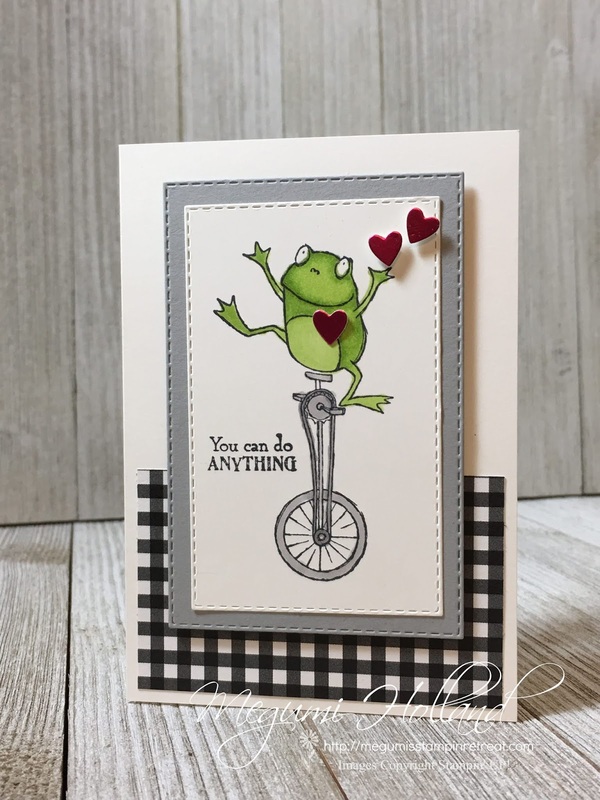 For this design I stamped the sentiment on a piece of Blushing Bride card stock and ran it through on my Big Shot using the Be Mine Stitched Framelits. 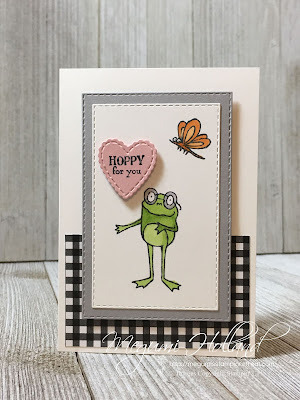 I just loved the stitched accent on the heart die! 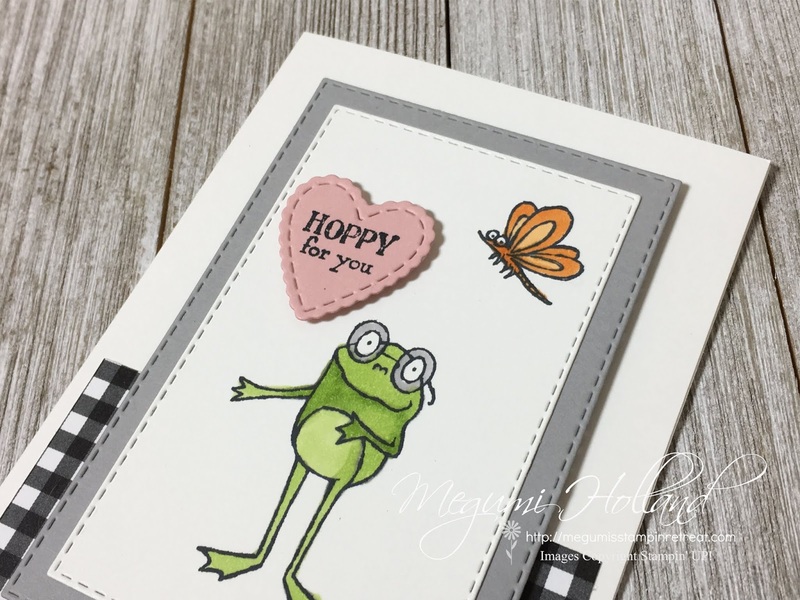 The butterfly stamp is also from the So Hoppy Together Stamp Set and I colored it with Pumpkin Pie Stampin' Blends. Using a pack of Stampin' Up! Note Cards and Envelopes makes card making easy and affordable. 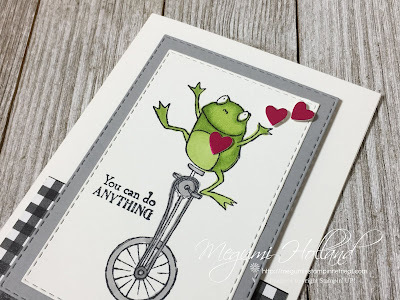 To dress up my envelope, I adhered an adorable frog patterned paper from Toil and Trouble Designer Series Paper, which was offered in the Holiday Catalog, to the envelope flap with Tombow Liquid Glue. To do this just cut out your patterned paper a little bit larger than your envelope flap and adhere with Tombow Liquid Glue. Simply trim off the excess using your scissors.